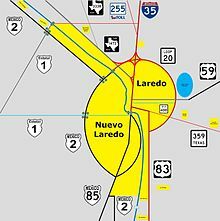 Laredo (/ləˈreɪdoʊ/ lə-RAY-doh; Spanish: [laˈɾeðo]) is a city in and the county seat of Webb County, Texas, United States, on the north bank of the Rio Grande in South Texas, across from Nuevo Laredo, Tamaulipas, Mexico. 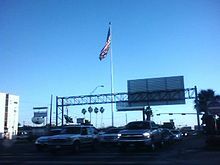 Laredo has the distinction of flying seven flags (the Flag of the Republic of the Rio Grande, which is now the flag of the city, in addition to the Six Flags of Texas). 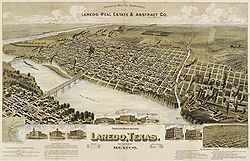 Founded in 1755, Laredo grew from a village to the capital of the brief Republic of the Rio Grande to the largest inland port on the Mexico–United States border. Laredo's economy is based on international trade with Mexico. Many major transportation companies have a facility in Laredo. The city is on the southern end of I-35 which makes it close to the manufacturers in northern Mexico. It has four international bridges and one railway bridge. "The Gateway City" and "The City Under Seven Flags"
According to the 2010 census, the city population was 236,091, making it the tenth-most populous city in the state of Texas and third-most populated on the Mexico–United States border, after San Diego, California, and El Paso, Texas. 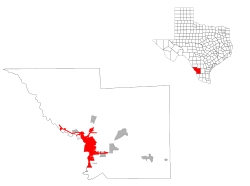 Its metropolitan area is the 178th-largest in the U.S. and includes all of Webb County, with a population of 250,304. Laredo is also part of the cross-border Laredo-Nuevo Laredo Metropolitan Area with an estimated population of 636,516. Because Laredo is 95.6 percent Hispanic and Latino, it is one of the least ethnically diverse cities in the United States. When economic diversity, household diversity, and social class diversity are considered, Laredo is rated the 19th least diverse city overall out of the 313 largest cities in the nation. Texas A&M International University and Laredo College are in Laredo. Laredo International Airport is within the Laredo city limits, while the Quetzalcoatl International Airport is nearby in Nuevo Laredo on the Mexican side. The biggest festival, Washington's Birthday Celebration, is held during the later part of January and the majority of February, attracting hundreds of thousands of tourists. The Jalapeño Festival, Border Beer Fest, Stockmen's Ball, Princess Pocahontas Pageant, Mr. South Texas Luncheon, an air show, and two major parades are all held in conjunction with the Washington's birthday events. Though the facility has been closed since 1999, the marquee of the Plaza Theater in downtown Laredo has been renovated A citizens committee, including the restaurateur Danny Lopez, Jr., of the Danny's Restaurant chain, sought without success to establish a private-public partnership to reopen the Plaza as a live entertainment venue. In 2018, the city council sought private entities, non-profit organizations, and an architect to make the facility useful again. The European colonial settlement of Villa de San Agustin de Laredo was founded in 1755 by Don Tomás Sánchez while the area was part of the Nuevo Santander region in the Spanish colony of New Spain. Villa de San Agustin de Laredo was named after Laredo, Cantabria, Spain and in honor of Saint Augustine of Hippo. In 1840, Laredo was the capital of the independent Republic of the Rio Grande, set up in opposition to Antonio López de Santa Anna; it was brought back into Mexico by military force. 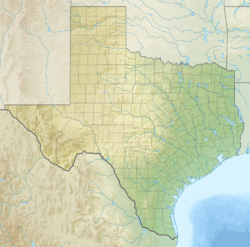 In 1846 during the Mexican–American War, the town was occupied by the Texas Rangers. After the war, the Treaty of Guadalupe-Hidalgo ceded the land to the United States. A referendum was taken in the town, which voted to petition the American military government in charge of the area to return the town to Mexico. When this petition was rejected, most of the population, who were Tejano and had been in the area for generations, moved across the river into Mexican territory, where they founded Nuevo Laredo. In 1849, the United States Army set up Fort McIntosh (originally Camp Crawford). Laredo was rechartered as a city in 1852. Laredo is one of the oldest crossing points along the Mexico–United States border, and the nation's largest inland port of entry. In 2005, Laredo celebrated the 250th anniversary of its founding. The origin of name of the original Spanish town of Laredo is unclear. Some scholars say the name stems from Glaretum which means "sandy, rocky place". Others state Laredo stems from a Basque word meaning "beautiful pastures". Laredo might also stem from the Latin Larida which means gull. In 1946, the Plaza Theater opened in downtown Laredo, but it closed in 1999, when the municipal government purchased the property from United Artists. In 2001, the Laredo City Council authorized a feasibility study to determine what use the old theater might yet have. In 2003, a consultant recommended converting the Plaza into a multi-purpose performing arts center, with dance recitals, concerts, live theater, and occasional films. In 2006, the city received an economic development grant for renovation of the Plaza. By 2008, renovations were made to the theater marquee and blade design. In 2011, a public-private partnership was attempted by two Laredo businessmen, Danny Lopez, Jr., and Victor Trevino, Jr., but that initiative never materialized. In 2018, the city council authorized the solicitation of private entities and non-profit organizations to operate the theater. The council is also seeking input from architects for the concept and design of renovations to the structure. In 1954, Laredo faced a devastating Rio Grande flood, when the water reached 61.35 feet (18.70 m), more than 10 feet (3.05 m) higher than in the previous 1932 flood, which had also caused great damage. According to Laredo historian Jerry D. Thompson of Texas A&M International University, the 1954 flood was "the largest in ninety-one years and the second largest according to archeological records in the last three hundred years." Many were left homeless for a time because of the calamity. Former Webb County administrative Judge Mercurio Martinez, Jr., recalls his father surveyed the depth of the water and advised residents to evacuate. Several downtown businesses had to remove their merchandise inventory or risk losing it to the rising waters. The flood caused the relocation of the Holding Institute. The international bridge was destroyed when it was struck by the floating railroad bridge, which had been hit by the debris of another bridge in Eagle Pass up the river. Photos of the flood by Teofilo Esquivel, Sr., are on the wall of a Danny's Restaurant on McPherson Avenue in Laredo. Cellist Yo-Yo Ma brought his Bach Project to the Juarez-Lincoln International Bridge in April 2019. According to the United States Census Bureau, the city has a total area of 102.6 square miles (265.7 km²), of which, 101.1 square miles (261.8 km²) of it is land and 1.5 square miles (3.9 km²) of it (1.37%) is covered by water. Laredo is on the west end of the Rio Grande Plains, south of the Edwards Plateau, west of the Coastal Plains, and east of the Mexican Mountains. The area consists of a few hills and flat land covered with grasses, oaks, and mesquite. Notable geographic features are the Rio Grande and Chacon Creek's man-made reservoir, Lake Casa Blanca, in Lake Casa Blanca International State Park. The lake is 371 acres (1.5 km2) of land and 1,650 acres (7 km2) of water. The six major creeks are Chacon Creek, San Ildefonso Creek, San Ygnacio Creek, Santa Isabel Creek, Sombrerillito Creek, and Zacate Creek, all of which drain into the Rio Grande. Several man-made reservoirs include the San Ildefonso Creek Lake (second-largest reservoir), and the Sombrerillito Creek Lake (third-largest reservoir). Laredo's climate is semiarid with hot temperatures in the summer and mild temperatures during the winter. The climate is considered to be hot semi-arid (Köppen: BSh). Its weather is affected by the Sierra Madre Oriental mountains to the west, the Gulf of Mexico to the east, and the Chihuahuan Desert of Northern Mexico and West Texas. Moisture from the Pacific is cut off by the Mexican mountain range. Because of its geographic location, Laredo's weather can range from long periods of heat to sudden, violent storms in a short period of time. Laredo winters are cold by South Texas standards: with average daytime highs around 66 °F (19 °C) and average overnight lows of 43 °F (6 °C), even though temperatures may easily reach 90 °F (32 °C) even during winter when the wind comes from the south. Although snowfall is rare in Laredo, it occurred most recently on Christmas Eve 2004 (1.1") and December 7–8, 2017 (1.3 inches). Laredo has an average high temperature around 101 °F (38 °C), and an average low around 77 °F (25 °C) during summer, and 21 inches (530 mm) of rain per year. As Laredo sometimes undergoes drought, a water conservation ordinance was implemented in 2003. Prior to the data below, Laredo reached 115F on May 7, 1927 and June 11, 1942. Laredo reached 5F on February 12, 1899.aredo reached 98F on January 17, 1936 and January 18, 1914, tied with Zapata's 98F on January 4, 1997 for the U.S. record highest during a January. Laredo reached 101F on November 17, 1906 followed by 21F 4 days later on November 21. Laredo had 4.5" of snow from March 9–10, 1932 followed by 100F 10 days later on March 20. As of the 2010, Laredo is the 81st-most populous city in the United States and the 10th-largest in Texas. According to the 2010 census there were 236,091 inhabitants in the city. According to respondents' self-identification on the 2010 Census, the vast majority of Laredo's population is ethnically Hispanic (of any race), with 95.6%. Some 4.4% of the population was not Hispanic/Latino (3.4% non-Hispanic White, 0.2% non-Hispanic Black or African American, 0.6% non-Hispanic Asian, 0.1% from some other race (non-Hispanic), and 0.1% of two or more races (non-Hispanic)). In the 2005 estimate, there were 99,675 males and 108,112 females. The average household contained 3.69 occupants. The population density was 2,250.5 people per square mile (868.9/km²). Of the 60,816 households, 56,247 or 92.5% were occupied: 33,832 were owner-occupied units and 22,415 were renter-occupied units. About 62.0% were married couples living together, 18.7% had a female householder with no husband present, and 14.7% were not families. Around 12.7% of all households were made up of individuals and 5.2% had someone living alone who was 65 years of age or older. The average household size was 3.69 and the average family size was 4.18. The city's population is distributed as 35.5% under the age of 18, 11.4% from 18 to 24, 29.5% from 25 to 44, 15.8% from 45 to 64, and 7.8% who were 65 years of age or older. The median age was 27 years. For every 100 females, there were 92.2 males. For every 100 females age 18 and over, there were 87.2 males. The median income for a household in the city was $32,019, and for a family was $32,577. The per capita income for the city was $12,269; 29.2% of families were below the poverty line. According to the United States Census Bureau, at a 2000 census, Laredo was the second-fastest growing city in the United States, after Las Vegas. A study released in 2015 by the Martin Prosperity Institute of the University of Toronto in Canada showed Laredo as the most "economically segregated" smaller metro area in the United States. The wealthy tend to congregate in enclaves and gated communities, such as Plantation, Regency, Lakeside, Winfield, and Alexander Estates. Most of the poor inhabit neighborhoods known for overall and long standing poverty, particularly in the southern portion of the city. Mayor Pete Saenz, however, said development is underway downtown and in The Heights neighborhood, once the city's most affluent residential area. 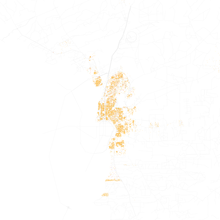 There are no de facto Anglo and African-American neighborhoods. The second and third cities cited in the study are Jackson, Tennessee, and El Paso, Texas. In 2016, Laredo was ranked the safest city in Texas for motorists and the 14th safest nationally. Its average annual car insurance rate is $1,515.76; the average years between accidents is 11.7. In 2016, the violent crime rate in Laredo dropped to 379 per 100,000 inhabitants, according to www.areavibes.com. The violent crime rate in Dallas was 694 per 100,000 inhabitants. In Houston it was 967 per 100,000 inhabitants. Walker Plaza office complex in Laredo was built in the early 1990s by the family of South Texas rancher Gene S. Walker, Sr. The former Cotulla Barbeque on McPherson Road at Taylor Street was closed, razed in 2012, and replaced by office buildings. Former U.S. President George W. Bush regularly visited the establishment when he was in town. Laredo has four South Texas banking institutions: Falcon International Bank, International Bank of Commerce, BBVA Compass, and Texas Community Bank. Laredo is the largest inland port in the United States, and Nuevo Laredo the largest in Latin America. This is due to their respective locations, served by Interstate Highway 35 / Mexican Federal Highway 85, the effects of the North American Free Trade Agreement (NAFTA), dozens of twin assembly plants on the Mexican side, and dozens of import export agencies to expedite trade. In January 2014, the Laredo customs district processed "$20 billion in two-way trade with Mexico", about half that for the entire US with Mexico for the month. Laredo is a shopping destination for Mexican shoppers from Northern Mexico. In 2015 the San Antonio Express-News reported the number of Mexican shoppers has declined due to drug war-related violence in Nuevo Laredo. More than 47 percent of United States international trade headed for Mexico and more than 36 percent of Mexican international trade crosses through the Laredo port of entry. Laredo's economy revolves around commercial and industrial warehousing, import, and export. As a major player in international trade, the Laredo area benefited from passage of the North American Free Trade Agreement, which has encouraged trade. The Laredo port of entry consists of four international bridges (with a proposed fifth one) crossing the Rio Grande into the Mexican states of Tamaulipas and Nuevo León. Retail sales attract shoppers from Northern Mexico and South Texas. There is one indoor shopping mall in Laredo, Mall del Norte, The Outlet Shoppes at Laredo, and another has not progressed past planning: Laredo Town Center, part of downtown redevelopment. There are dozens of shopping centers. The Streets of Laredo Urban Mall is an association created by businesses on Iturbide Street in the San Agustin historical district to beautify and renovate the area, which has a pedestrian scale. The Outlet Shoppes at Laredo, 380,000 sq ft (35,000 m2) owned by Horizon Group Properties, opened March 2017 with as many as seventy-seven stores, including Banana Republic, Tommy Hilfiger, Michael Kors, Brooks Brothers, OshKosh B'Gosh, Old Navy, New York and Company, and Kay Jewelers. Laredo has increased the number of non-agricultural jobs from 55,100 in January 1996 to 86,600 in October 2007. Laredo has had a higher job growth rate (2%-6.5%) than the state as a whole because of expanded international trade through the North American Free Trade Agreement. In 2007, Laredo experienced a job growth rate of 2.5%. As of October 2007, the Laredo unemployment rate was 4.1% or 3,700 unemployed persons, as compared to 3.9% in Texas statewide. This is a significant drop since the mid-1990s, when Laredo's unemployment was over 15%. Laredo has had positive job market growth since the mid-1990s; setbacks in the mining (oil/gas) industry shifted a few thousand workers to other industries such as international trade and construction. Many large employers in the oil and gas industries shut down operations in Laredo and across Texas, and shifted to foreign countries. The same effect occurred in the garment industry (Levis and Haggar) along the Texas border area. Laredo lost its only garment-producing company (Barry), costing the jobs of about 300 workers. Laredo's strong job growth rate in retail and transportation services limited the adverse effects of long-term unemployment from the few massive layoffs of the late 1990s. Laredo's success with international trade is also a vulnerability; it depends on changes to Mexico's economy, that status of immigration laws (along with daily border crossings: shoppers and commercial trade), and terrorism. In 2014, according to the financial research company NerdWallet, Laredo had the worst pay for women of any city in the United States, with a large gender gap: an average annual salary of $24,700 for women, compared to nearly $35,000 for men. The gender pay gap in Laredo increased 25 percent between 2007 and 2012. Only the wealthy city of Frisco in the Dallas-Fort Worth metroplex, had a greater pay gap within Texas than did Laredo. According to census reports, Laredo has a 30 percent rate of poverty. Laredo households headed by women with children under the age of eighteen have a 51 percent poverty rate. By contrast, the San Jose, California, area, the heart of the tech industry, has an average pay of $56,000, ranking first nationally. The Washington's Birthday Celebration (WBCA) is a month-long event that celebrates George Washington's birthday. It is the largest annual celebration of its kind in the United States, with 400,000 attendees. It was founded in 1898 by the Improved Order of Red Men, local chapter Yaqui Tribe #59. The first celebration was a success, and its popularity grew rapidly; in 1923 it received its state charter. In 1924, the celebration held its first colonial pageant, which featured 13 girls from Laredo, representing the 13 original colonies. The celebration includes parades, a carnival, an air show, fireworks, live concerts, and a citywide prom during which many of Laredo's elite dress in very formal attire. The related Jalapeño Festival is one of the United States' top 10 eating festivals. The month of March is observed in honor of the Mexican-American labor organizer Cesar Chavez. A march, organized by the local League of United Latin American Citizens, is held downtown the last Saturday morning of March to remember Chavez for United Farm Workers, which in the 1960s and 1970s organized migrant laborers to obtain improved working conditions. Republic of the Rio Grande Capitol Building Museum is in the downtown historical district next to the historic La Posada Hotel. What was once the Capitol building now showcases memorabilia from the short lived Republic of the Rio Grande. It displays pictures, books, and furniture from the 19th century Laredo area, and offers guided tours for school-age children and adults year-round. Because of this Republic, Laredo had flown seven flags instead of the traditional Six Flags over Texas. The Laredo Center for the Arts is in downtown Laredo. The building houses three galleries: the Goodman Gallery, the Laredo Art League Gallery and the Lilia G. Martinez Gallery. The Center for the Arts, in the former City Hall offices known as "The Mercado", displays regional artwork and provides community events for children and adults. The Laredo Little Theater provides Laredo with live stage performances. The theater also hosts comedians. Imaginarium of South Texas (formerly Laredo Children's Museum), in Mall del Norte, provides a hands-on experience with science, technology, and art for Laredo's youth. A second museum is planned on the Texas A&M International University campus. The Nuevo Santander Museum Complex is composed of restored buildings of Fort McIntosh, a historical collection of photographs of the fort, the main guardhouse, which has World War I (1914–1918) memorabilia, and a science and technology museum. The Lamar Bruni Vergara Science Center Planetarium is on the Texas A&M International University campus. The Planetarium surrounds audiences in a dome with an accurate image of the night sky showing all the motions and cycles of the Sun, Moon, planets, and constellations in the sky. 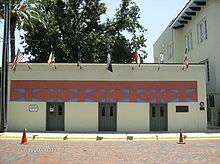 The Joe A. Guerra Laredo Public Library was first housed on the second floor of the City Hall, now known as the Market Hall, in 1916. In 1974, the Laredo Public Library moved to the historic Bruni Plaza in downtown Laredo. In 1993, the citizens of Laredo approved the construction of a new main library at McPherson and Calton roads, which opened on February 1, 1998. On July 22, 2016, the structure was named in honor of Joe A. Guerra, a former member of the Laredo City Council known for his support for the library and a personal passion for reading. Council member Roque Vela, who first proposed the structure be named for Guerra, described the former councilman, who died in 2010, as "someone I looked up to for his unwavering commitment to public service. I am especially proud to know the library and reading were passions of Mr. Guerra." The Laredo Public Library, which still uses the Dewey Decimal Classification system, has a 60,000 sq ft (6,000 m2). main library and two branches. The main library is in central Laredo; the Bruni Plaza Branch is downtown east of Washington Street, and the Santo Niño Branch is in south Laredo. Two new libraries opened in 2014, one in northwest Laredo, the Fasken Library on March 14, and another in the south sometime in July. The city is populated with both adult and family entertainment, such as bars, nightclubs, sports fields, movie theaters, family restaurants, and other entertainment venues. Around the Springfield area, several restaurant/bars have been opened, including Agave Azul, Cosmos, Old No.2 and Lima Sol. This area has proven to be especially popular with college students. Renovated St. Patrick's Catholic Church is on Del Mar Boulevard across from the Laredo Fire Department. The First United Methodist Church near the intersection of McClelland and Guadalupe; the cornerstone from the 1916 building on Hidalgo Street downtown was moved to the current location in 1949. Most of Laredo's architecture is of Spanish Colonial, American, and Mexican flavor. Most of Laredo's Spanish Colonial style buildings are in downtown Laredo. More modern American architecture can be seen along Interstate Highway 35 as well as in the downtown area. Heavily Roman Catholic in church affiliation, Laredo has impressive houses of worship. The oldest congregation, now San Agustin Cathedral, on the downtown historic plaza, dates to the founding of the city in 1755. The striking building we see today was begun in 1871. Our Lady of Guadalupe is an imposing structure in Romanesque Revival Lombard (North Italian) style. It was designed by Leo M. J. Dielmann of San Antonio, a popular architect of Catholic buildings, and built for a Mexican-American and Hispanic congregation in the inner-city, at San Jorge Avenue and Callaghan St. Dielmann was commissioned by Church authorities to design churches for similar congregations in Houston and San Antonio. He also did the San Agustin parish school, and may have had a hand in the San Agustin church itself. Other Catholic churches of note include Blessed Sacrament and Christ the King, both in the Heights neighborhood, St. John Neumann Church at Hillside Road and Springfield Avenue, San Martin de Porres at 1704 Sandman Street near the municipal water tower, and the large St. Patrick Catholic Church on Del Mar Boulevard, founded in 1970 and renovated in 2009. The Catholic diocese office, the headquarters of Bishop James Tamayo, is on Corpus Christi Street north of Guadalupe Street. San Luis Rey Catholic Church at the intersection of Sanders and San Jose opened on September 16, 1951. Outside is a flowered prayer shrine. The congregation of the Church of the Redeemer, at the intersection of Main and Garcia streets downtown, observed its centennial on August 29, 2009. Its building is another work by Leo M.J. Dielmann. Both the First United Methodist Church, in 1949, and the Christ Church Episcopal, were designed by Henry Steinbomer, a popular and prolific San Antonio architect who is credited with more than 100 churches and related buildings during the 1940s and 50s, from the Lower Rio Grande Valley mostly in South and West Texas, from the Sacred Heart Cathedral in San Angelo to Union Church in Monterrey, Mexico. Other Laredo churches include Baptist, Presbyterian, Lutheran, Assembly of God, Mormon, and non-denominational congregations. The homeless and other indigent are served downtown through Bethany House, established in 1982 by Roman Catholic priest Father Charles M. McNaboe (1929–1996). Streets of Laredo is a 1949 western film starring William Holden, Macdonald Carey and William Bendix as three outlaws who rescue a young girl, played by Mona Freeman. When they become separated, two reluctantly become Texas Rangers, while the third continues on a life of crime. In the 1957 Christmas episode entitled "Laredo" of NBC's western series, Tales of Wells Fargo, series character Jim Hardie (Dale Robertson) must track gunrunners across the United States/Mexican border, a quest which keeps him from spending the holiday with friends in Laredo as he had intended. The episode stars Henry Rowland, Rodolfo Hoyos, Jr., Karl Swenson and Pierre Watkin. In 1958, ABC aired the second episode, "Ambush in Laredo", of the 17-part miniseries, Texas John Slaughter starring Tom Tryon, with Robert Middleton, Chris Alcaide and Judson Pratt, broadcast as part of Walt Disney Presents. The 1959 western film, Gunmen from Laredo, stars Robert Knapp, Walter Coy, Paul Birch, and Ron Hayes in the story of a man seeking revenge for the murder of his wife. He winds up in prison on a false murder charge, but the marshal allows him to escape to pursue the man who killed his wife. In the episode "Cactus Lady" (February 21, 1961) of the NBC western television series, Laramie, it is revealed series regular Jess Harper, played by Robert Fuller, had been nearly hanged by mistake in the border city of Laredo c. 1870 because of the McCanles gang, played by Arthur Hunnicutt, L. Q. Jones, Harry Dean Stanton and Anita Sands. In the storyline, the gang arrives suddenly in Laramie. From 1965 to 1967, NBC aired an hour-long western television series entitled, Laredo, with the actors Philip Carey, William Smith, Peter Brown and Neville Brand. A spin-off of The Virginian, Laredo, with elements of comedy, focuses on Texas Rangers in the border country. It is available on DVD.Laredo was also broadcast on weekdays on the Encore Westerns Channel, having filled the time slot previously occupied by double episodes of the ABC/Warner Bros. series, Lawman, which also co-stars Peter Brown. The 1983 film Eddie Macon's Run, based on a James McLendon novel, features John Schneider as Eddie Macon, who is wrongly convicted of mostly minor crimes. While performing at a prison rodeo in Huntsville, Texas, he escapes and heads for Laredo, where he hopes to join his family in Mexico. Carl "Buster" Marzack (Kirk Douglas) is a cop in hot pursuit of Eddie. Without transportation, Eddie journeys on foot. He ends up in the woods, where he is nearly killed. He meets Jilly Buck (Lee Purcell), a bored rich girl who agrees to help him. Lone Star is a 1996 American mystery film written and directed by John Sayles and set in a small town in Texas. The ensemble cast features Chris Cooper, Kris Kristofferson, Matthew McConaughey and Elizabeth Peña and deals with a sheriff's investigation into the murder of one of his predecessors. The movie was filmed in Del Rio, Eagle Pass, and Laredo. The 2011 series, Bordertown: Laredo, is a 10-episode documentary on the Arts and Entertainment Network based on the work of the narcotics unit of the Laredo Police Department. Laredo has been the subject of several songs in popular culture. One of the most popular songs is the "Streets of Laredo", originally known as "A Cowboy's Lament" and written by Frank H. Maynard, who lived mostly in Colorado. It has been recorded by artists such as Johnny Cash, Marty Robbins, Waylon Jennings, John Cale, Roy Rogers and Prefab Sprout (who also made a lyrical reference to Laredo in an early song, Cue Fanfare), and is even featured in a Charlie's Angels episode ("Pretty Angels all in a Row", Season 2, Episode 3). On October 28, 1958, in the episode "The Ghost" of the ABC/WB western series, Sugarfoot, "The Streets of Laredo" is performed by the child actor Tommy Rettig. The first song on Marty Robbins' 1966 LP The Drifter was "Meet Me Tonight in Laredo." The song described a young Comanchero who woos a young woman despite her family's disapproval. The couple leave Laredo together to start a new life in the Sierre Madre mountains. From 1959 to 1972, the six-member singing group, The Rondels dominated the musical scene in Laredo. Carlos Saenz Landin, the lead singer, left the group to work for the Dallas Independent School District but years later returned to Laredo. Lead guitarist Humberto Donovan served in the United States Marine Corps. The late Roberto Alonzo played the bass guitar. Sammy Ibarra, played the keyboard and composed the song, “Lo Mucho Que Te Quiero (The More I Love You).” He subsequently became a pastor. Singer Noe Adolfo Esparza pursued a college career and became a supervisor for Southwestern Bell Telephone Company. As of 2017, he was still performing with the oldies group, Los Fabulosos in Laredo. Joe Lee Vera served in the United States Navy and played drums for The Rondels. Several of Vera's brothers were drummers too. The Rondels packed the Laredo Civic Center Auditorium. Two other songs characteristic of the group are “Ya-Ya” and “All Night Worker.” With their disbanding, Juan Cisneros of Laredo recalls The Rondels "left a large void that will never be forgotten." Another popular song is "Laredo" by country music star Chris Cagle, who sings about Laredo having a positive influence on his significant other. Ranked at the top of the charts in 1978 in several countries in Europe is Baccara's "The Devil Sent You to Laredo". "Laredo" is a song from the album Infinite Arms, released by Band of Horses in 2010. "Laredo Tornado" is a track from Electric Light Orchestra's 1974 concept album Eldorado. It uses the idea of missing the 'happy hunting grounds' of Laredo as a metaphor for the protagonist's loss of his dream-world. Joe Ely has a song and album entitled "Letter to Laredo". The Laredo Heat is a United Soccer Leagues Premier Development League team. The team's home stadium is the Texas A&M International University Soccer Complex. The team was founded in 2004. In the 2006 season, the Laredo Heat finished Runner-up yet made it only to the first round of the Open Cup. In the 2007 season, the Laredo Heat were the Southern Conference champions and won the PDL Championship. The Heat were on hiatus for the 2016 and 2017 seasons. In November 2017, the Heat announced they will be an expansion team of the National Premier Soccer League in 2018. The Laredo Honey Badgers were a proposed professional indoor soccer team that was founded in April 2013, expected to make its debut in the Professional Arena Soccer League with the 2013–14 season. The team was to play its home games at the Laredo Energy Arena. The official name and colors (black and chrome) of the team were decided with fan participation. However, after several delays the team postponed its launch and eventually ceased operations. The Laredo Lemurs, a professional baseball team, played their first season in the independent American Association in 2012 with home games at Uni-Trade Stadium. They won the South Division in their inaugural season, but were eliminated in the first playoff round. The Lemurs won the league championship in 2015 but ceased operations after the 2016 season. The Laredo Roses were a professional women's full contact football team in the South Texas Sugar N Spice Football League that began play in the 2012 season. The Roses played their home games at the Uni-Trade Stadium. The female players used short-shorts and half-cut jerseys during games. Laredo Swarm was a semi-professional basketball in the relaunched American Basketball Association. They started playing in 2015 in Laredo Energy Arena. The team was disbanded before the 2017–18 season. The Laredo Energy Arena, formerly Laredo Entertainment Center, is at Loop 20 and Jacaman Road. The LEA was strongly pushed to fruition by former Laredo Mayor Betty Flores. LEA was home to the former Laredo Bucks. The 178,000-square-foot (16,500 m2), $36.5 million facility seats 8,002 people for ice hockey and arena football, and up to 10,000 for concerts. It has fourteen luxury suites, four meeting rooms and a private club for two hundred charter members. It was completed in mid-2002 through an increase in the Laredo sales tax of .25 percent. Sports that can be played at the LEA include ice hockey, arena football, indoor soccer, basketball, wrestling, and boxing. The arena also hosts many events such as The Laredo Hunting and Fishing Show, Miss Texas USA, Laredo Home and Garden Show, and high school graduation ceremonies. Well-known artists and bands that have performed in the arena include Lil Wayne, Rihanna, Kesha, Pitbull, Flo Rida, Shakira, Enrique Iglesias, Tool, Aerosmith, Kiss, Elton John, Styx, REO Speedwagon, ZZ Top, Lynyrd Skynyrd, Ricky Martin, George Lopez, T.I., Ludacris, Cher, Hilary Duff Monster Jam and WWE. The Uni-Trade Stadium is Laredo's newest baseball field. The stadium is near the Laredo Energy Arena. The project was approved by the city council and was voted in favor of (with 61.32% of the votes in favor 38.68% against) constructing it with money collected since 2004 by a .25 percent sales tax increase. There is a surplus of about $15 million. The stadium will be home to the Laredo Lemurs. United Independent School District's students use the Student Activity Complex on State Highway 359 for football, soccer, and baseball. Opened in the summer of 2002, it has the city's first artificial grass stadium. The SAC was also the home of the Laredo Heat. The capacity is 8,500 spectators. Texas A&M International University Soccer Complex (also known as Dustdevil Field and TAMIU Soccer Complex) was built in 2006 and renovated in 2007. The soccer complex is on the Texas A&M International University campus. The complex has two soccer stadiums with a seating capacity of four thousand each. The Dustdevil Field is the new home stadium to the 2007 champion team Laredo Heat member of the United Soccer Leagues Premier Development League (PDL) and the TAMIU Dustdevils women and men's soccer teams member of the Heartland Conference, NCAA Division II. The original Shirley Field was next to the Civic Center and R&T Martin High School on San Bernardo Avenue. It was built in 1937, along with Martin High School. Shirley Field was the location for outdoor athletics for Laredo Independent School District and also hosts the annual Border Olympics events. It seats up to about 6,000 fans with additional seating at the 2 endzones. Professional Mexican soccer teams have played various exhibition games here, noting the real grass allows for "better" soccer games. The various sports played on the stadium are football, soccer and track & field events. Major renovations are slated for this historic stadium. In November 2009 Shirley Field was demolished and was rebuilt by the 2011 football season. The total cost of the reconstruction was $12,000,000 and it now seats 8,000 fans and features artificial turf. Krueger Field is in north Laredo and is owned by United Independent School District. The stadium has a capacity of 5,000 and is used to play football and soccer high school games. It is home to United High School's and John B. Alexander High School's football and soccer teams. Veterans Field is a 5,000 seat baseball park which was known as West Martin Field. Major renovation is happening to update the 1950 ball park. Veterans Field was also the home to the five-time champion Mexican Baseball League team Tecolotes de los Dos Laredos from 1985 to 2003. Veterans Field is also home to the Texas A&M International University's Heartland Conference NCAA Division II Dustdevils baseball team. Prior to the construction of the Laredo Energy Arena most major concerts and shows were performed at the Laredo Civic Center. The Laredo Civic Center complex has an auditorium with 1,979 seats and a banquet and exhibit hall with 1,635 seats. Lake Casa Blanca International State Park, on Loop 20, has a 1,680-acre (7 km2) artificial lake along with cooking out, camping, picnicking, lake swimming, skiing, boating, and mountain biking. The most popular recreational use of the lake is fishing. A boat ramp and fishing pier is available on the lake's eastern side. The lake is a popular destination for winter Texans. The park was operated by the City of Laredo and Webb County before it was acquired by the state in 1990 and opened in March 1991. Laredo has three 18-hole golf courses: the Laredo Country Club, the Casa Blanca Golf Course. and Laredo's newest course Max A. Mandel Municipal Golf Course. The Laredo Country Club is an 18-hole private course with 7,125 yards (6,515 m) of golf. The golf course has a rating of 74.6, a slope rating of 133, and has a par of 72. The country club was designed by Joseph S. Finger and was opened in 1983. The Casa Blanca Golf Course is an 18-hole course with 6,590 yards (6,030 m) of golf. The golf course has a rating of 72.5, a slope rating of 125, and has a par of 72. The golf course was designed by Leon Howard and was opened in 1967. The Max A. Mandel Municipal Golf Course is an 18-hole course with 7,200 yards (6,600 m) of golf. The golf course has a par of 72. The golf course was designed by Robert Trent Jones II Golf Course Architects and was opened in 2012. A memorial honoring the forty-one Hispanic soldiers who have received the Medal of Honor was built in Laredo, Texas in 2002. The plaza was named after the only Laredo Medal of Honor recipient David B. Barkley. The David B. Barkley Plaza has a bronze statue of David B. Barkley and an American flag measuring 100 ft by 50 ft and is 308 ft tall making it the tallest flagpole in the United States. The memorial is at 27°30′22″N 99°30′8″W﻿ / ﻿27.50611°N 99.50222°W﻿ / 27.50611; -99.50222﻿ (David B. Barkley Plaza). Relatively new to Laredoans, this mountain bike trail is approximately 4 miles of single-track dirt trails, widening occasionally to double-track. Some technical parts make this trail challenging, but not impossible for beginners who can briefly walk their bikes before getting on their way again. Thorned shrubs and cacti encompass bikers, so be careful! The trail is well-marked and improvements continue to be seen as the months go by. The trail is off Shiloh Road at the end of Livingston Road. Administrative headquarters of the Laredo Fire Department are on Del Mar Boulevard across from St. Patrick's Catholic Church. The Laredo city government is a strong city council – weak mayor system. The mayor presides over the eight-member city council, but he/she may only vote to break a tie. City Council elections are based on single-member districts and campaigns have no party affiliations. Municipal elections are now held in November (formerly in May) of even-numbered years. The municipal government is administered by the city manager hired by the city council. All city elected offices have a four-year term and are nonpartisan though most officials have a Democratic party preference or affiliation. City council meetings are held on Mondays and can be viewed on the Public-access television cable TV channel or live online at Public Access Channel live stream. The current mayor, Pete Saenz, was elected in 2014 to succeed his fellow Democrat, the term-limited Raul G. Salinas. In his bid for a second term, Salinas had in 2010 defeated then city council members Jose A. Valdez, Jr., and Gene Belmares. Salinas also failed in a bid to unseat Webb County treasurer Delia Perales in the Democratic runoff election held on May 27, 2014. In 2015, the city council named Jesus R. "Chuy" Olivares (born c. 1959) as the city manager to succeed the retiring Carlos Villarreal. Olivares was paid just over $249,000 annually, which included a car and telephone allowance. He was formerly the city manager of Eagle Pass in Maverick County. On May 15, 2017, Olivares suddenly retired as city manager when he became a target of an ongoing Federal Bureau of Investigation probe into widespread public corruption in Webb County. Olivares claims thirty-eight years of municipal experience in Laredo (where was formerly the parks director), Austin, and Eagle Pass. Mayor Saenz expressed support for the decision as one of mutual convenience for Olivares and the city. The council then named the assistant city manager, Horacio De Leon, as the acting city manager. City council members receive a monthly gross salary of $1,000 plus $750 monthly for maintaining a home office, $150 per month for a city cell phone, and $750 monthly for fuel expenses. The annual total compensation is hence $31,800. However, total annual compensation will increase to $50,000. The mayor receives about $61,200; that will rise to $75,000 a year beginning with the 2018 election. Since council terms are staggered, those increases begin with each forthcoming election cycle. On August 1, 2014, then city councilman Jorge A. Vera was arrested on a felony drug possession charge. He was accused of having earlier in the week offered cocaine to an off-duty agent of the United States Border Patrol and her friends outside a Laredo restaurant. First elected to the council in 2012, Vera faced a state jail felony (possession of a controlled substance) and a Class B misdemeanor (filing a false report). Vera was subsequently indicted on both charges by a grand jury of the Texas 406th Judicial District Court. His arraignment was in the 49th District Court. Because Vera did not resign from the city council, a recall election was held on November 4, 2014. By a wide margin, voters in District VII supported Vera's recall. Attorney George Altgelt won the special election to succeed Vera. In March 2017, Ray Garner resigned after four years as the chief of the Laredo Police Department. He instead returns to his former position as police chief of the United Independent School District. Then city manager Jesus Olivares appointed Captain Gabriel E. Martinez, Jr., a 30-year veteran of the department, as the acting police chief to succeed Garner. The United States District Courthouse is a relatively new building adjacent to the Webb County Courthouse. The United States Border Patrol Laredo Sector Headquarters is at 207 W. Del Mar Blvd, Laredo, Texas. The United States Postal Service operates its main Post Office at 2700 East Saunders Street south of Laredo International Airport. Postal branches are downtown and at 2395 East Del Mar Boulevard. The Texas Army National Guard armory is at 6001 E. Bob Bullock Loop 20 Laredo, Texas. The Colburn Memorial United States Army Reserve Center is at 1 W End Washington St, Laredo, Texas. The Texas Department of Criminal Justice (TDCJ) operates the Laredo Parole Office. The private prison operator GEO Group runs the Rio Grande Detention Center in Laredo, which opened in 2008 and holds a maximum of 1900 federal detainees. In March 2014, it was reported Laredo and Webb County have a child abuse rate at nearly double the state average. In 2012–2013, 515 child clients were served by the Children's Advocacy Center in Laredo, 105 for physical abuse and 360 for sexual abuse. Statewide, 9.3 percent of children have been victims of physical abuse, but in Laredo the rate is 17 to 21 percent. A special investigator for Child Protective Services said he now sees two to three cases per day of such inflictions. Newman Elementary School at 1300 Alta Vista Blvd., is named for the late businessman B. P. Newman and his widow, Peggy. Two school districts, the Laredo Independent School District and the United Independent School District, and eight private schools serve Laredo. The Laredo Independent School District (LISD) serves the areas in central Laredo. The LISD high schools are Cigarroa High School, Martin High School, J. W. Nixon High School and the Laredo Early College High School. LISD also has three magnet schools: Dr. Dennis D. Cantu Health Science Magnet School, LISD Magnet for Engineering and Technology Education, and Vidal M. Trevino School of Communications and Fine Arts. The United Independent School District serves the rest of Laredo and northern Webb County. The UISD high schools are John B. Alexander High School, Lyndon B. Johnson High School, United High School, and United South High School. UISD has three magnet schools: John B. Alexander Health Science Magnet, United Engineering Magnet, and the United South Business Magnet. There are thirty-nine schools within UISD and more are under construction or development. United ISD is one of the state's fastest growing districts, serving almost forty thousand students and covering an area the physical size of Rhode Island. Laredo is home to Laredo College and Texas A&M International University (TAMIU). The University of Texas Health Science Center at San Antonio has a campus in Laredo. Laredo College is a two-campus institution which offers two-year Associate's degrees. The main campus is at the western end of downtown Laredo near the Rio Grande, on the site of the former Fort McIntosh. This fort played a major role in the development of Laredo, as it protected the community from Indian raids in its early history. Several of the old buildings at the fort were converted into classrooms, but after renovation programs nearly all of the campus structures are now modern. The smaller, newer second campus, Laredo College South Campus, is in south Laredo along U. S. Route 83. The Texas A&M International University is a 4/6 year university that offers bachelor's and master's degrees. On April 22, 2004, the Texas Higher Education Coordinating Board in Austin, Texas approved Texas A&M International University to grant its first Ph.D. in International Business Administration. TAMIU's College of Business Administration has been named an outstanding business school in The Princeton Review's "Best 282 Business Schools", 2007 Edition, and ranked third in the nation for the category: "Greatest Opportunity for Minority Students." The university's campus is in Northeast Laredo along Loop 20. The university was an extension of Texas A&I-Kingsville and later the former Laredo State University. Prior to its current location along Bob Bullock Loop 20, the university was housed with the Laredo College downtown campus. The University of Texas Health Science Center campus is in East Laredo near U.S. Highway 59 and the Laredo Medical Center. The campus is an extension university from UTHSC in San Antonio, Texas. The university offers doctoral degrees in the medical and dental fields. According to Nielsen Media Research, the Laredo region (which includes Webb and Zapata counties) is ranked 185th market by population size in the United States. The first station to broadcast in Laredo was KGNS in 1956, followed by KVTV in 1973, then KJTB (now KLDO) in 1985. Notably television networks missing from Laredo's airwaves are PBS and The CW. Laredo once had a full-power local The CW affiliate, KGNS-DT2, but on July 3, 2014 the affiliation switched to ABC. Prior to that KJTB channel 27, from January 1985 to October 1988 was Laredo's ABC affiliate. KJTB was later bought by Entravision and affiliated the station to Telemundo and changed its callsign to KLDO. Today KLDO is affiliated to Univision. Before KJTB, KGNS, an NBC affiliate had a secondary affiliation to ABC from its founding in 1956 through KJTB's founding in 1985. On November 6, 2013, KGNS reached an agreement to add the ABC affiliation. The ABC affiliate was to have been launched in February 2014 on KGNS's subchannel 8.2. But it was not until July 2014 when KGNS dropped The CW programming and added ABC programming. In December 2014, all Nuevo Laredo stations must turn off analog television broadcasting and broadcast only digitally. According to Arbitron, the Laredo region (which includes Jim Hogg, Webb, and Zapata counties) is ranked 191st market by population size. PR:Suspected pirate radio stations since they are not licensed with Federal Communications Commission (FCC) in the United States or COFETEL in Mexico. Some pirate stations are suspected, due to the fact other licensed stations nearby share the same frequency, such as 106.5 Radio Voz and KMAE from nearby Bruni, Texas and 103.3 Radio 33 and XHAHU-FM from nearby Anáhuac, Nuevo León, each city less than 50 miles from Laredo. Laredo Specialty Hospital, near the Laredo Medical Center, handles certain patients requiring long-term care. In addition to the University of Texas Health Science Center branch, there are five other principal medical centers in Laredo: the Laredo Medical Center, Doctor's Hospital, Gateway Community Health Center, Providence Surgical & Medical Center, and the Laredo Specialty Hospital. Doctors Hospital is Laredo's second-largest medical center. The hospital complex is over 250,000 square feet (23,000 m2), with 180 licensed beds on a 58-acre (230,000 m2) campus. Affiliated with Universal Health Services, it is on Loop 20 in north Laredo. The Doctors Regional Cancer Treatment Center offers comprehensive cancer services. The Providence Surgical & Medical Center is an ambulatory health care center in north-central Laredo and also owned by Universal Health Services. The Gateway Community Health Center is the third-largest medical center in Laredo. The health center's main building is 64,000 square feet (5,900 m2). The Medical center moved to its new $11,000,000 building in 2006. The main Gateway Community Health Center is in East Laredo, close to U.S. Highway 59. It also has three branches in the Laredo area: the South Clinic, El Cenizo Community Center, and Quad City Community Center. The Laredo Specialty Hospital is the fourth-largest medical center in Laredo. It is owned by Ernest Health Inc. and was founded by Elmo Lopez, Jr., on May 22, 2006, and admitted its first patient within hours of operation. The grand opening took place in March 2007. In 2016, 82.3 percent of working Laredo residents commuted by driving alone, 10.2 percent carpooled, 0.9 percent used public transportation, and 1.9 percent walked. About 2 percent of working Laredo residents commuted by all other means, including taxi, bicycle, and motorcycles. About 2.6 percent worked at home. In 2015, 6.5 percent of city of Laredo households were without a car, which decreased slightly to 5.9 percent in 2016. The national average was 8.7 percent in 2016. Laredo averaged 1.85 cars per household in 2016, compared to a national average of 1.8 per household. Laredo is served by the Laredo International Airport. Daily flights are available to Houston (George Bush Intercontinental Airport) and to Dallas-Fort Worth International Airport. Tri-weekly flights to Las Vegas, Nevada are available. After Laredo Air Force Base closed in the mid-1970s, the federal government handed over the old air force base and property to the City of Laredo for a new municipal airport. From the mid-1970s until the mid-1990s, the airport used a small terminal for passenger airline service and several old hangars for air cargo and private aircraft. A new state-of-the art passenger terminal was built along the then newly constructed Loop 20 to accommodate larger jets and to increase passenger air travel through Laredo. Expansion of air cargo facilities, taxiways and aprons, air cargo carriers such as DHL, FedEx, UPS, BAX, and others have responded by adding commercial air cargo jet services. Laredo also has two medical helipads, at Laredo Medical Center and Doctor's Hospital. El Metro is the public transit system that operates in the city with 21 fixed routes and Paratransit services, with approximately 4.6 million passengers per year. El Metro works with a fleet of over 47 fixed route buses, 2 trolleys and 18 Paratransit/El Lift vans. The El Metro hub is in downtown Laredo at El Metro Transit Center. The Center also houses Greyhound Lines and provides fee-based daily parking for downtown shoppers and workers. Rural transportation is provided by the Webb County operated "El Aguila Rural Transportation" (the Eagle) bus services. El Aguila serves fixed daily routes from rural communities (Bruni, El Cenizo, Mirando City, Oilton, and Rio Bravo) to the downtown El Metro Transit Center. Interstate 2 is proposed to be extended to Laredo following US 83. If its extended, I-2's terminus would be I-69W. It would also serve as the southern end of I-35. U.S. Highway 59 Laredo-Lancaster. Included on the I-69W corridor. Tom DeLay, the Republican House Majority Leader from 2003 to 2006, was born in Laredo. Jovita Idar (1885-1946) was an Mexican-American journalist, political activist and civil rights worker, who fought for the rights of Mexican Americans and women. Edmund J. Davis (1827−1883), governor of Texas from 1869 to 1873; resided in Laredo during parts of the 1850s. Jeremy Vuolo, (born 1987), is an American former soccer player for Major League Soccer and the North American Soccer League. He is a pastor and appears on the TLC (TV network) show "Counting On". He is the husband of Jinger Duggar Vuolo (m. 2016). ^ "Government". City of Laredo. City of Laredo. Retrieved January 29, 2017. ^ a b Bureau, U.S. Census. "American FactFinder - Community Facts". factfinder.census.gov. Retrieved 27 August 2017. 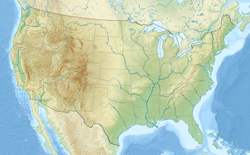 ^ "World Gazetteer: America – largest cities (per geographical entity)". Archived from the original on 2007-10-01. ^ Julia Wallace (August 27, 2018). "Operator needed for historic Plaza Theater after unanimous vote by the Laredo City Council". Laredo Morning Times. Retrieved August 30, 2018. ^ Martinez, Norma; Terrazas, Lauren; Morgan, Jack (April 13, 2019). "Cellist Yo-Yo Ma Plays Bach In Shadow Of Border Crossing". NPR News. Retrieved 2019-04-14. ^ Jackson, Amanda (April 14, 2019). "Cellist Yo-Yo Ma plays a concert at a US-Mexico border crossing to make a point". CNN. Retrieved 2019-04-16. ^ "Boundary Map of Laredo, Texas". MapTechnica. Retrieved 2017-01-04. ^ "NOWData – NOAA Online Weather Data". National Oceanic and Atmospheric Administration. Retrieved July 2, 2015. ^ "TX Laredo 2". National Oceanic and Atmospheric Administration. Retrieved July 2, 2015. ^ "Texas Almanac: City Population History 1850–2000" (PDF). Texasalmanac.com. Retrieved 27 August 2017. ^ "Population Estimates: City and Town Totals: Vintage 2012". Archived from the original on 2013-06-01. Retrieved 2013-05-21. ^ "Census of Population and Housing". Census.gov. Retrieved May 26, 2018. ^ Bureau, U.S. Census. "American FactFinder - Community Facts". factfinder.census.gov. Retrieved 27 August 2017. ^ Julia Wallace (May 28, 2016). "Laredo named one of the safest cities for drivers". The Laredo Morning Times. Retrieved June 10, 2016. ^ Aguilar, Julian (13 March 2014). "In Laredo, a Quiet Symbol of Closer Ties With Mexico". new York Times. Retrieved 5 June 2015. The South Texas city houses America's busiest inland port. In January alone, the Laredo customs district saw about $20 billion in two-way trade with Mexico, according to WorldCity, a Florida-based company that uses census data to track trade patterns. That figure represented about half of the $41 billion that the United States saw in overall trading with its southern neighbor for the month. "The City of Laredo Transfers Ownership of World Trade Bridge to GSA". United States General Services Administration. 13 March 2014. Retrieved 5 June 2015. Since its inception the World Trade Bridge Port of Entry has become the busiest commercial port on the southwest border. ^ MacCormack, John (22 September 2012). "Laredo's image hammered by drug violence". San Antonio Express-News. Retrieved 5 June 2015. ^ "Federal Reserve Bank of Dallas "Southwest Economy "". Dallasfed.org. Archived from the original on 27 September 2007. Retrieved 27 August 2017. ^ "Texas Metro Market Overview: Laredo: Labor page 14" (PDF). Recenter.tamu.edu. Archived from the original (PDF) on 3 February 2015. Retrieved 27 August 2017. ^ "121st Washington's Birthday Celebration". Wbcalaredo.org. Retrieved 27 August 2017. ^ "Republic of the Rio Grande Museum Home Page". Webbheritage.org. Archived from the original on 1 February 2015. Retrieved 27 August 2017. ^ "laredocenter4thearts". laredocenter4thearts. Retrieved 27 August 2017. ^ "Imaginarium of South Texas - Links". Imaginariumstx.org. Retrieved 27 August 2017. ^ "Second Imaginarium Museum on TAMIU Campus". Gyroscopeinc.com. Retrieved 27 August 2017. ^ "Home". Laredolibrary.org. Retrieved 27 August 2017. ^ Judith Rayo (July 22, 2016). "Laredo Public Library renamed after former city councilman". The Laredo Morning Times. Retrieved July 24, 2016. ^ Bragg, Valerie. "UPDATE: Two new libraries coming to Laredo". Kgns.tv. Archived from the original on 28 August 2017. Retrieved 27 August 2017. ^ B., ROBINSON, WILLARD (12 June 2010). "CHURCH ARCHITECTURE". Tshaonline.org. Retrieved 27 August 2017. ^ "A Guide to the Leo M. J. Dielmann Papers, Drawings, and Photographs, 1847-1961". Lib.utexas.edu. Retrieved 27 August 2017. ^ STEINBOMER, KENDALL, DOROTHY (15 June 2010). "STEINBOMER, HENRY JOHN". Tshaonline.org. Retrieved 27 August 2017. ^ José David Saldívar, The Dialectics of Our America: Genealogy, Cultural Critique, and Literary History (Duke University Press, 1991), 52. ^ ""Laredo" on Tales of Wells Fargo, December 23, 1957". Internet Movie Data Base. Retrieved February 7, 2013. ^ "Texas John Slaughter: "Ambush at Laredo", November 14, 1958". Internet Movie Data Base. Retrieved December 6, 2012. ^ "Gunmen from Laredo (1959)". Internet Movie Data Base. Retrieved December 6, 2012. ^ "Laramie: "Cactus Lady", February 21, 1961". Internet Movie Data Base. Retrieved December 6, 2012. ^ "Laredo". Internet Movie Data Base. Retrieved December 6, 2012. ^ "2013 Monthly Schedule, All times EST". angelfire.com. Retrieved July 4, 2013. ^ "Eddie Macon's Run (1983)". The New York Times. Retrieved August 5, 2014. ^ Lone Star on IMDb . ^ "Bordertown: Laredo". aetv.com. Retrieved December 6, 2012. ^ "The Ghost". Classic Television Archives. Retrieved December 11, 2013. ^ Juan Cisneros (February 25, 2017). "Writer: The Rondels were top musical group of the 60s". Laredo Morning Times. Retrieved March 1, 2017. ^ Scavuzzo, Diane (December 1, 2015). "SABBATICAL FOR PDL'S LAREDO HEAT". goalnation.com. Retrieved March 18, 2018. ^ Davis, Zach (November 28, 2017). "Heat SC returning to Laredo in 2018". lmtonline.com. Retrieved March 17, 2018. ^ "LAREDO HEAT SOCCER CLUB JOINS THE NPSL". npsl.com. November 28, 2017. Archived from the original on 2018-03-18. Retrieved March 18, 2018. ^ Bailey, Ryan (April 18, 2013). "Indoor Soccer Coming to Laredo". Laredo, Texas: KGNS-TV. Archived from the original on October 29, 2013. Retrieved May 28, 2013. ^ "Professional Arena Soccer League Coming to Laredo Energy Arena". Professional Arena Soccer League. April 18, 2013. Archived from the original on May 15, 2013. Retrieved May 28, 2013. ^ "Indoor Soccer Coming to Laredo". Laredo, Texas: KGNS-TV. May 18, 2013. Archived from the original on October 29, 2013. Retrieved May 28, 2013. ^ Davis, Zach (October 19, 2017). "Swarm will not return this year". lmtonline.com. Retrieved March 18, 2018. ^ "Laredo Morning Times; Webb County Vote Totals". Lmtonline.com. Retrieved 27 August 2017. ^ "Lake Casa Blanca International State Park — Texas Parks & Wildlife Department". Tpwd.state.tx.us. Retrieved 27 August 2017. ^ "Laredo Country Club Website". Memberstatements.com. Retrieved 27 August 2017. ^ "ラクトフェリンはライオンがオススメの理由". Casablancagolfcourse.com. Retrieved 27 August 2017. ^ "Max A. Mandel Municipal Golf Course". Themaxlaredo.com. Retrieved 27 August 2017. ^ "Laredo Country Club, Laredo, TX". GolfLink. Retrieved 27 August 2017. ^ "Casa Blanca Golf Course, Laredo, TX". GolfLink. Retrieved 27 August 2017. ^ "Modern Steel Construction" (PDF). Modernsteel.com. Archived from the original (PDF) on 2010-12-18. Retrieved 27 August 2017. ^ "History of Laredo Mayors" (PDF). City of Laredo. Retrieved June 28, 2016. ^ Julia Wallace (May 16, 2017). "In fallout from FBI raids, Laredo city manager announces retirement". Laredo Morning Times. Retrieved May 17, 2017. ^ Julia Wallace (May 2017). "Laredo mayor calls city manager's retirement 'convenient for both sides'". Laredo Morning Times. Retrieved May 18, 2017. ^ Gabriela A. Trevino (April 4, 2016). "Compensation for Laredo City Council members, mayor to increase". Laredo Morning Times. Retrieved April 5, 2016. ^ "Ray Garner resgns as LPD chief". Laredo Morning Times. March 24, 2017. Retrieved March 31, 2017. ^ "Post Office Location – LAREDO Archived 2010-07-14 at the Wayback Machine." United States Postal Service. Retrieved on May 21, 2010. ^ "Post Office Location – DEL MAR Archived 2010-07-13 at the Wayback Machine." United States Postal Service. Retrieved on May 21, 2010. ^ "Post Office Location – EL CENTRO Archived 2010-07-14 at the Wayback Machine." United States Postal Service. Retrieved on May 21, 2010. ^ "Parole Division Region IV Archived 2011-09-04 at the Wayback Machine." Texas Department of Criminal Justice. Retrieved on May 21, 2010. ^ "Rio Grande Detention Center". GEO Group. Archived from the original on 22 July 2016. Retrieved 30 July 2016. ^ "Home - Laredo Independent School District". Laredoisd.org. Retrieved 27 August 2017. ^ "St. Augustine High School - St. Augustine High School". St-augustine.org. Retrieved 27 August 2017. ^ King, Rory. "TAMIU Home". Tamiu.edu. Retrieved 27 August 2017. ^ "Texas A&M International University". Tamiu.edu. Retrieved 27 August 2017. ^ "Texas A&M International University". Tamiu.edu. Archived from the original on 28 August 2017. Retrieved 27 August 2017. ^ "Fast Facts". Tamiu.edu. Retrieved 27 August 2017. ^ MacCormack, John. "Sharp-penned watchdog in Laredo calls it quits". San Antonio Express-News. Hearst. Retrieved 28 September 2015. ^ "Nielson: Local Television Market Universe Estimates" (PDF). Nielsen.com. Retrieved 27 August 2017. ^ Gray to Air ABC on KGNS Subchannel TVNewsCheck, November 6, 2013. ^ "LSH - We are passionate, patient caregivers". lsh.ernesthealth.com. Retrieved 27 August 2017. ^ Odie Arambula; et al. (March 20, 1997). "Former 'hands-on DA' Borchers dies in San Antonio hospital". Laredo Morning Times. Archived from the original on July 14, 2014. Retrieved June 13, 2014. ^ "Mexico orders Laredo-born drug lord 'La Barbie' extradited to US". Laredo Sun. Agence France-Presse. Archived from the original on December 14, 2010. Retrieved November 22, 2010. ^ "Sister Cities". Ci.laredo.tx.us. Retrieved 27 August 2017.